Hey guys my name is Jeff Mullen. I am the president of www.NFLAnswers.com and I know there is talent at the semi-pro level that should be playing at a higher level. If anyone would like to try to get there name out there, contact me. My website is free to everyone! Contact me and I'll see what I can do for you! Jeff Mullen ~ FBGuru@aol.com ~ 302-423-2525 Also, if you need an agent, there's a link to one on my site! God bless all! 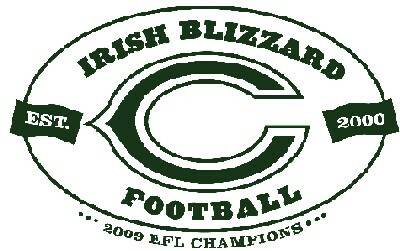 Greetings and good luck to the Clinton Irish Blizzard football team from the U12 AAU Rolesville Crushers baseball team in NC!!! Your site and name is original as I have not seen any BLIZZARDS. Stop by and visit our site and sign our guestbook sometime too. umm do you have to be irish to play on ur team? Best wishes to the Irish Blizzard. Great Website, Great Team, and a really great #41, we love you. Wish we could be there. Good luck on Nov. 15th!!!! Good Luck in 2003! Wishing a successful season from the MD Jaguars!